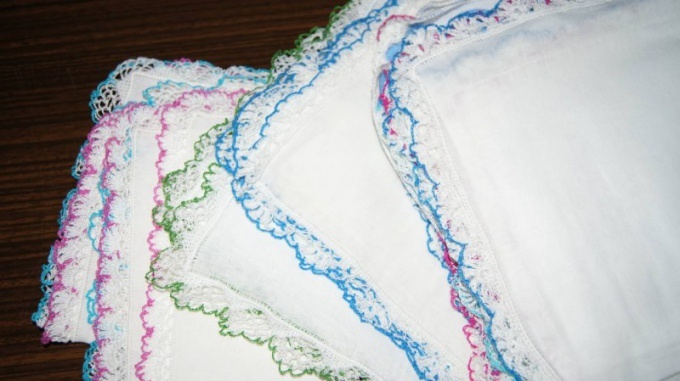 Handkerchiefs were used in the second century of our era. It was a luxury and was only used by rich and famous people. Rags of the finest silk, muslin embroidered, lace, impregnated perfume and aromatic compositions. Modern handkerchief is a piece of cloth or paper intended for the hygiene of the nose or arms. To turn a handkerchief into a romantic accessory this ladies, tie it with lace with a hook. Prepare cotton threads, thin hook, openwork select the scheme for knitting. Note the consistent thickness of the thread hook size. For cambric handkerchiefs buy simple thread number sixty, decorate plain items with glomeruli "beautiful", "iris". Take to work steel flat hook size. The handkerchief wash, carefully iron. Select easiest way is to work without prior obvalivanie. When tying in the front row gently pierce crochet fabric in one hole promazyvaya three columns. Perform one row on such a scheme, adding in each corner of the scarf with three loops. Then knit in the following pattern: five loops, one dense column by puncture in the fourth loop of the initial number (the hook catch the thread of the skein, pull it through two loops). Repeat the scheme to the end of the row, and in the corners add five eyelets. The third row is knit the same as the previous, but dense column enter in the middle of the cell, which was formed from five air loops. Every time you expand the corners of the edges that the product was smooth. In the fourth, the fifth row, repeat the technique, securing the air peak in a checkerboard pattern. The original processing method is crochet the finished braid. Measure the perimeter of the nasal shawl, buy the desired quantity of the ribbon with a rare edge. Tie it along the selected diagram, sew the handkerchief, not forgetting to gently bend the corners. Can combine good air and dense loops, columns without nakida. Original and unusual looks of the bow handkerchief, tied with colored thread. An ordinary piece of cloth can become in your hands a masterpiece that not only are intended, but also proud to show off to their friends.